Apo Reef is a coral reef system in the Philippines situated on the western waters of Occidental Mindoro province in the Mindoro Strait. Encompassing 34 square kilometres (13 sq mi), it is considered the world's second-largest contiguous coral reef system, and is the largest in the country. The reef and its surrounding waters are protected areas in the country administered as the Apo Reef Natural Park (ARNP). It is one of the best known and most popular dive sites in the country. It is listed in the tentative list for UNESCO World Heritage Sites. Apo Reef can be found around 15 nautical miles (28 km; 17 mi) west of the nearest coast of the Philippine island of Mindoro. It is separated from main island by the Apo East Pass of the Mindoro Strait. Politically, the reef lies within the jurisdiction of the Province of Occidental Mindoro in Region IV-B of the Philippines and more accurately of the Municipality of Sablayan. Tourism activities are administered by local government of Sablayan and the local office of the Department of Environment and Natural Resources (DENR). The reef system of Apo Reef in Occidental Mindoro. Apo Reef is roughly a triangular coral atoll formation approximately 26 kilometres (16 mi) from the north to the south tip, and 20 kilometres (12 mi) from east to west. It is separated by two lagoon systems, the north and south lagoons which are bounded by narrow reef platforms. It is a 34 square kilometres (13 sq mi) almost triangular northern and southern atoll-like reefs separated by a deep channel that is open to the west. The channel runs east to west from 1.8 to 30 metres (5 ft 11 in to 98 ft 5 in) deep with a fine white sand bottom, numerous mounds and patches of branching corals under the deep blue water. The north lagoon is an enclosed triangular coral reef platform partly exposed during low tide. It is relatively shallow with depths of about 2–10 metres (6 ft 7 in–32 ft 10 in). While the south lagoon is an inverted triangular coral platform enclosed on two sides and is about 30 metres (98 ft) in depth. Likewise, reef limestone and coralline sand on the east and southeastern sides dominantly underlie the area. The main geographical feature of Apo Reef is submerged, but three islands mark it on the surface: the Apo Island, Apo Menor (locally known as Binangaan) and Cayos del Bajo ("Keys of the bank", locally known as Tinangkapan). The islands are uninhabited. Since the declaration of “no-take-zone” policy at Apo Reef Natural Park in 2007, only protected area personnel and members of the Task Force MARLEN (Marine and Apo Reef Law Enforcement for Nature), who are task to implement protection and conservation work at the park, stays in the protected area on weekly shifts. The largest island in the Apo Reef and has a lighthouse, white beach, lagoon, mangroves, and karstic rock formations. Not to be confused with Apo Island just south of Dumaguete, Negros Oriental. 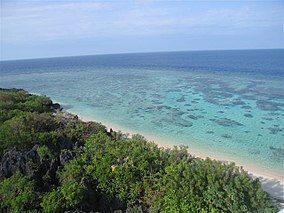 The largest is Apo Island at 22 hectares (54 acres) with mangroves and beach vegetation. The reef surrounding the island extends to 0.80 kilometres (1⁄2 mi) in places. Outside the lagoonal mangroves in the eastern and southern sides of Apo Island, the soil is sandy-to-sandy loam that is less in silt and clay particles. On the other hand, the lagoonal mangroves have a sandy loam to clay loam soil, underlain by decomposed plant residues or coarse materials. Apo Island is separated from Apo Reef by a narrow, deep channel. The island is about 23 nautical miles (43 km; 26 mi) from Mindoro and about 20 nautical miles (37 km; 23 mi) from Nanga and Tara Islands, the nearest of the islands off Busuanga Island on the western side of the Mindoro Strait. The Apo Reef Light, situated on the northeast part of the island, warns ship about the location of this navigational hazard. The island is situated at a two and a half hour navigation 240° from Sablayan by pump boat (banka). The island houses a permanent ranger base which is monitoring the national park. An administrative desk is collecting the environmental fees. It is possible to stay overnight in tents subject to certain conditions. Very limited facilities are available onshore to protect the island's fragile ecosystem. The Apo Menor Island is the second largest island in the Apo Reef and is primarily made up of rocks. Apo Menor is located near the western end of Apo Reef, about 2.4 kilometres (1.5 mi) east of Apo Island. It is a rocky limestone island with relatively little vegetation. Cayos del Bajo are flat coralline rock formations with no vegetation on the northern lagoon near the eastern edge of the reef. At low tide, many small rocks are dry on the reef, particularly along its north side. The main activity of the reef relates to its underwater quality. Scuba diving and snorkeling in Apo Reef area are exceptional due to the quality of the flora, the fauna and the clarity of the water and white sand. Many species can be observed in deep or shallow waters in particular, sharks, giant napoleons, mantas and murenas. The coral is in good health and growing. The Apo Reef is a protected area of the Philippines classified as a Natural park encompassing 274.69 square kilometres (106.06 sq mi). Of the total area, 157.92 square kilometres (60.97 sq mi) comprises the Apo Reef Natural Park while the remaining 116.77 square kilometres (45.09 sq mi) constitute a buffer zone surrounding the protected area. Prior to its declaration as a protected area, Apo Reef was first officially declared a "Marine Park" by then Philippine president Ferdinand Marcos in 1980. This was followed with the local government of Sablayan declaring the reef a special "Tourism Zone and Marine Reserve" three years later. In 1996, the entire reef was declared a protected natural park by then-president Fidel Ramos. In 2006, the Protected Areas and Wildlife Bureau of the Philippine Department of Environment and Natural Resources submitted the reef to the UNESCO World Heritage Centre for consideration as a World Heritage Site. Following a survey by the local chapter of the World Wide Fund for Nature, fishing within the reef was banned by the Philippine government in September 2007. The marine park opened for tourists to help generate funds for its protection as well as provide an alternative livelihood for hundreds of fishermen in the area. All people accessing Apo Reef need to pay an environmental fee. ^ a b c "Apo Reef Natural Park". UNESCO World Heritage: Tentative Lists. UNESCO. 2006-05-16. Archived from the original on 11 October 2007. Retrieved 2007-10-08. ^ Hutchinson, Gretchen and Ventura, Edgar M. (1987). "Philippine Dive Versions", pg. 74. Philippine Dive Versions, Makati. ^ a b c d "United States Coast Pilot Philippine Islands". ^ (2014-03-19). "How To Get There". Apo Reef Natural Park Official Website. Retrieved on 2014-09-25. ^ a b c d (2014-02-14). "Topography and Soil". Apo Reef Natural Park Official Website. Retrieved on 2014-09-25. ^ a b "Presidential Proclamation 868" (Press release). Office of the President of the Republic of the Philippines. 1996-09-06. ^ "Protected Areas in Region 4B – MIMAROPA" Archived 2014-10-06 at the Wayback Machine. Biodiversity Management Bureau. Retrieved on 2014-09-25. ^ "Presidential Proclamation 1801" (Press release). Office of the President of the Republic of the Philippines. 1980. ^ "Resolution No. 1108" (Press release). Sangguniang Bayan ng Sablayan, Occidental Mindoro. 1983. ^ "Philippines bans fishing to revive biggest reef". Yahoo! News. Yahoo! Inc. 2007-10-02. Archived from the original on October 6, 2007. Retrieved 2007-10-08. ^ "Philippines bans fishing to revive biggest reef". Reuters News. Reuters Inc. 2007-10-02. Retrieved 2007-10-08. ^ "Sustainable Ecosystems and Community News: Philippines bans fishing to revive biggest reef". enn.com. Retrieved 24 August 2015. Department of Environment and Natural Resources, Conservation of Priority Protected Areas Project, Apo Reef Natural Park Brochure. Sablayan, Occidental Mindoro; List of Proclaimed Marine Protected Areas; Protected Areas And Wildlife Bureau, 2004. Wikimedia Commons has media related to Apo Reef. This page was last edited on 2 April 2019, at 14:22 (UTC).